Apologies to Bobby Darin for the misuse of his lyrics. Collaboration and partnerships are indeed the name of the game and this is evident in the South. The announcement of the partnership between the Southland Museum and Art Gallery and the Invercargill Public Art Gallery is an example of this. Both organisations are staffed with very skilled, knowledgeable and passionate people. I am excited about what will eventuate when these creatives get together. No doubt they will brainstorm ideas for inspiring and interactive exhibitions that tell stories, challenge our thoughts and expand our thinking. When not working for Arts Murihiku I have the privilege of working with young people at James Hargest Junior Campus. I love my job and the young people I work with. I believe the world is in a ‘good hands’ when I think of the children I teach and our own children. When our beloved Museum closed earlier this year, I saw this as an opportunity for some of my students to design some exhibits for the new museum that they would be interested in and enjoy seeing. They came up many different concepts. One was an exhibition that focused on the Southland Sting/ Steel, that had an arcade style game as part of it. Fun, telling a story and interactive. It would be great to have lots of community involvement in our new space. No doubt public programming will be an integral part of this new venture. 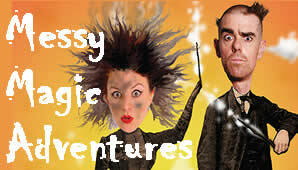 Last Friday, two thousand young children packed out Stadium Southland to experience ‘Messy Magic Adventure’. Bought to us by WE CAN MAKE MAGIC, a collaboration between thespians Jade Gillies and Sarah McCarthy. That’s visionary- a collaboration between, passionate creatives, our local stadium, funders and supportive locals meant that children had the opportunity to experience some quality theatre. We want our young people to be well- rounded and healthy individuals. Nourishing our creative side has been shown to have a very positive effective on our overall well-being. Starting this experience young is important so that it becomes a natural part of our lives. Hopefully making every day just a little more magical. The celebration of Matariki is becoming more mainstream. It is unique to Aotearoa/ New Zealand. A group of locals who have been involved in producing events around Matariki in the region are in the process of collaborating to help educate people and celebrate Matariki in 2019, all with a Murihiku flavour. The purpose is to help people understanding what Matariki is, by looking at its significance, understanding that it is special to Aotearoa/ New Zealand and that it is a celebration for all cultures. It is hoped that there will be many events held throughout the South during late June, early July. Regular events in the past have included a Matariki breakfast, the star dome and Matariki activities aimed at families and children. In 2019 it is hoped that the Lantern Parade that has been part of Winer celebrations in the past be resurrected. Community Lantern making workshops are planned to be held in the library in March 2019 for Community/ Families and Educators. Keep an eye out for details. “Collaboration, it’s the name of the game”,when we have – Tūhono manawa- the joining of hearts, anything is possible.